There have been so many Witcher 3 trailers at this point that CD Projekt RED are able to really focus in on a theme. This one, for instance, is almost entirely about dismemberment. It still manages to be less bizarre than this one, featuring a narrator who keeps boasting about how much racism is in their world. The Witcher 3: Wild Hunt is two weeks away. 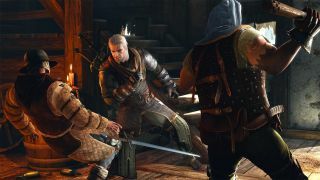 Only last night, CDPR and Green Man Gaming were having a disagreement about the validity of the latter's Witcher 3 keys. CDPR says the discounted copies are from an "unknown source"; GMG claims they're offering legitimate keys from a third-party.